Fr. John Whiteford's Commentary and Reflections: Spanking: What Saith the Scripture? When I cited these passages in the comments as being what the Word of the Lord had to say on the question, I ran into a sad phenomenon that I have encountered with some regularity: the scoffing of an Orthodox Christian at the idea that the words of Scripture might be of significance... particularly when they come from the Old Testament. This is not how Orthodox Christians approach Scripture, if the Fathers of the Church are any guide. "And that from a child thou hast known the holy scriptures, which are able to make thee wise unto salvation through faith which is in Christ Jesus. All scripture is given by inspiration of God, and is profitable for doctrine, for reproof, for correction, for instruction in righteousness: That the man of God may be perfect, thoroughly furnished unto all good works." Here he was clearly referring specifically to the Old Testament, because the New Testament was not written when St. Timothy was a child. And it says that all Scripture is inspired by God, and is profitable for every need a Christian might have in living a Godly life. "Spare the rod and spoil the child (Proverbs 13:24). Here there is reference to the people who appear to love their children, but in fact do not; so spoiling is the result of sparing -- not of not sparing. Having children is a matter of no little import: we are responsible even for their salvation. On that reasoning Eli would not have paid a severe penalty. Whereas those who love them correct them diligently -- not casually, but diligently: since nature bids us be sparing, he makes no mention of excess. Hence he says, I instilled affection in you, not for you to harm your loved ones, but for you to care for them; so refrain from inappropriate affection" (St. John Chrysostom, Robert Charles Hill, Trans., Commentary on the Sages, Volume 2, Brookline, MA: Holy Cross Press, 2006, p. 133f). "The corrections of the father who does not spare the rod is useful, that he may render his son's soul obedient to the precepts of salvation. He punishes with a rod, as we read, "I shall punish their offenses with a rod" (St. Ambrose, Letter 45, quoted in Ancient Christian Commentary on Scripture: Old Testament, Vol. IX, J. Robert Wright, ed. (Downers Grove, IL: Intervasity Press, 2005) p. 96). "For in another place he says that not only the servant, but also the undisdained son, must be corrected with stripes, and that with great fruits as the result; for he says, "Thou shall beat him with the rod, and shall deliver his soul from hell;" and elsewhere he says, "He that spareth the rod hateth his son." For, give us a man who with right faith and true understanding can say with all the energy of his heart, "My soul thirsteth for God, for the living God: when shall I come and appear before God?" and for such an one there is no need of the terror of hell, to say nothing of temporal punishments or imperial laws, seeing that with him it is so indispensable a blessing to cleave unto the Lord, that he not only dreads being parted from that happiness as a heavy punishment, but can scarcely even bear delay in its attainment. But yet, before the good sons can say they have "a desire to depart, and to be with Christ," many must first be recalled to their Lord by the stripes of temporal scourging, like evil slaves, and in some degree like good-for-nothing fugitives" (St. Augustine, Correction of the Donatists, 6:21). "As small children who are negligent in learning become more attentive and obedient after being punished by their teacher or tutor, and as they do not listen before the lash, but, after feeling the pain of a beating, hear and respond as though their ears were just recently opened, improving also in memory, so likewise with those who neglect divine doctrine and spurn the commandments. For, after they experience God's correction and discipline, then the commandments of God which had always been known to them and always neglected are more readily received as though by ears freshly cleansed" (St. Basil the Great, Homily on the Beginning of Proverbs 5, quoted in Ancient Christian Commentary on Scripture: Old Testament, Vol. IX, J. Robert Wright, ed. (Downers Grove, IL: Intervasity Press, 2005) p. 147). "For whom the Lord loveth he chasteneth, and scourgeth every son whom he receiveth. If ye endure chastening, God dealeth with you as with sons; for what son is he whom the father chasteneth not? But if ye be without chastisement, whereof all are partakers, then are ye bastards, and not sons" (Hebrews 12:6-8). If God, who is love, deals with us this way, it obviously is not unloving for us to emulate him in how we deal with our children. So there is really no scriptural or patristic basis for rejecting corporal punishment for children. St. Benedict, in his rule, actually called for it as a means of disciplining monks, under some circumstances. It is only in our times, when parents often have only one or two children, and a lot more leisure time on their hands than past generations, that not spanking children could even be possible. My mother raised 5 boys... mostly, by herself (my parents divorced when I was about 6), and she did not have the time to sit and have 30 minute conversations with us every time we acted up. When you have lots of kids, you have to have swift and sure punishments when they do not behave. But even when parents have only one or two children, not spanking often results in children (particularly boys) who are out of control, and who terrorize their parents... because they were never taught to respect their parents. I remember when I was 13, my mother gave me a whipping with a belt, and was hitting me on the legs, which I didn't think was quite fair... and by this time I was a lot bigger and stronger than she was. I took the belt away from her. However, because she had instilled a healthy fear and respect for her, she talked me into giving her that belt back, and finishing the whipping. On the other hand, I once had a woman in my office (in my secular job) who had a toddler who was the most defiant child I had ever seen. He kept acting up, and finally, she lightly tapped him on the hand to express her disapproval. He pointed back at her with anger, and shouted "That bad!" Then she asked me what she should do about her 17 year old son, who she said often beat her up. That was one problem my mother never had... not one out of five boys ever dared raise a hand against her, because she used the rod of correction with liberality, as Scripture suggests we should. While one is free to think that they might know better than the Scriptures, and are wiser than all the generations that preceded them on how children should be raised, the decline in our culture since these modern approaches came into vogue do not indicate that these approaches have thus far been very successful. And in the schools today, when children misbehave, they are now often taken to juvenile court for matters that were once handled by a few swats on the behind. I fail to see how it more loving to put children into the criminal justice system for behaving like children always have, than it is to spank them, as saith the Scripture. "He that loveth his son causeth him oft to feel the rod, that he may have joy of him in the end. He that chastiseth his son shall profit by him, and shall boast of him among his acquaintance. He that teacheth his son will make his enemy jealous: and before his friends he shall rejoice of him. When his father dieth, yet he is as though he were not dead: for he hath left one behind him that is like himself. While he lived, he saw and rejoiced in him: and when he died, he was not grieved. He left behind him an avenger against his enemies, and one that shall requite kindness to his friends. He that maketh much of [i.e., spoils] his son shall bind up his wounds; and his bowels will be troubled at every cry. An horse not broken becometh headstrong: and a child left to himself will be wilful. Cocker [i.e. pamper] thy child, and he shall make thee afraid: play with him, and he will bring thee to heaviness. Laugh not with him, lest thou suffer with him, and lest thou gnash thy teeth in the end. Give him not liberty in youth: beat his sides while he is still young, lest becoming stubborn, he disobey thee. (And overlook not his ignorance. Bow down his neck in his youth.) Train up thy son, and work with him, lest by his looseness thou be offended" (Sirach 30:1-13). Update: As for the often repeated claim that spanking is harmful to children, I would recommend the following article: Spare the Rod? 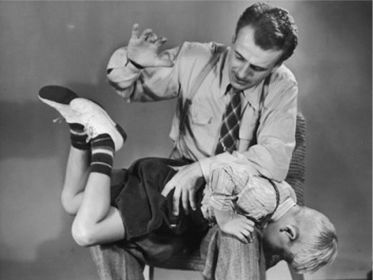 New Research Challenges Spanking Critics.